If you’re a fan of ‘keeping it weird’ then get ready to rejoice because Dr. Martens have teamed up with bright and bold champions of kitsch, Lazy Oaf. The nonchalant, ‘don’t take life too seriously’ vibe of Lazy Oaf perfectly complements the old-school cool feel of Dr. Martens for a perfect rebel style collab. 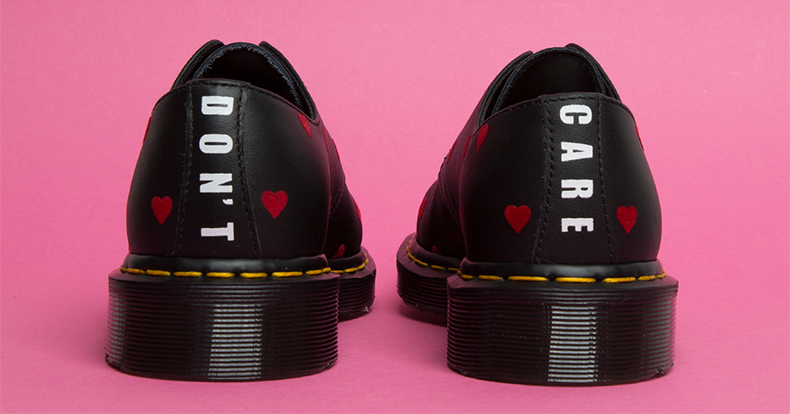 With sassy slogans, tough platforms and velvet laces – not to mention a covering of hearts – this Dr. Martens X Lazy Oaf collection is bound to win over fans of both brands. You can wear your feelings on your feet – not so subtly telling everyone what you’re thinking. 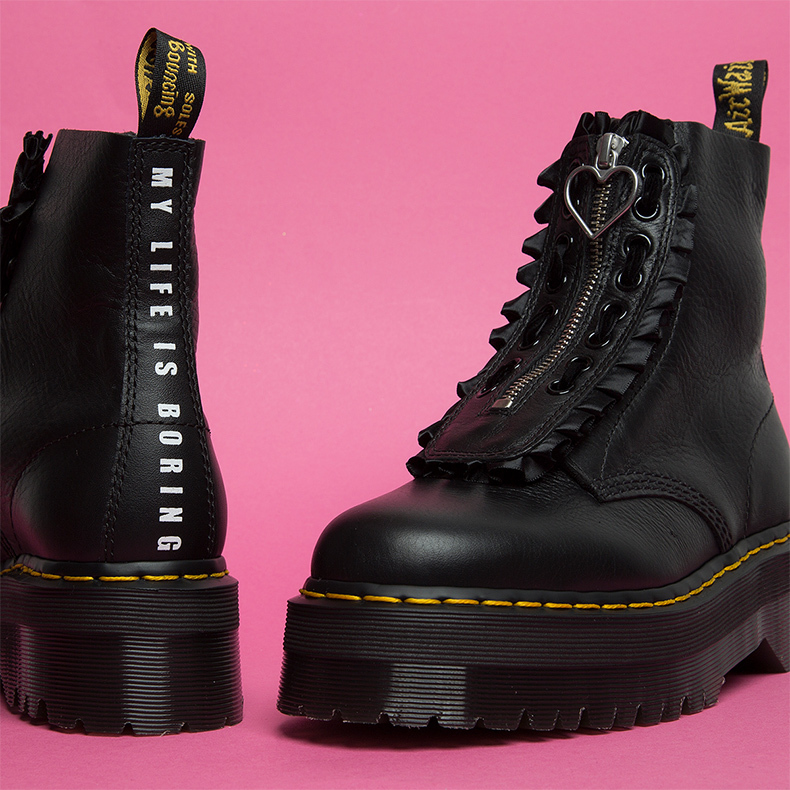 The new pack is topped off with classic Lazy Oaf lines ‘Don’t Care’ and ‘My Life is Boring’. Talk about statement shoes. First up is the classic 1461 3 Eye with a twist. It’s a shoe the Queen of Hearts herself would be proud of. Little red hearts covering the shoe like polka-dots and a big bold DON’T CARE’ down the heel, as well as velvet laces for a luxe feel. Perfect for adding a little bit of attitude to your outfit. If you’re feeling tough then the Jungle Boot is the one for you. 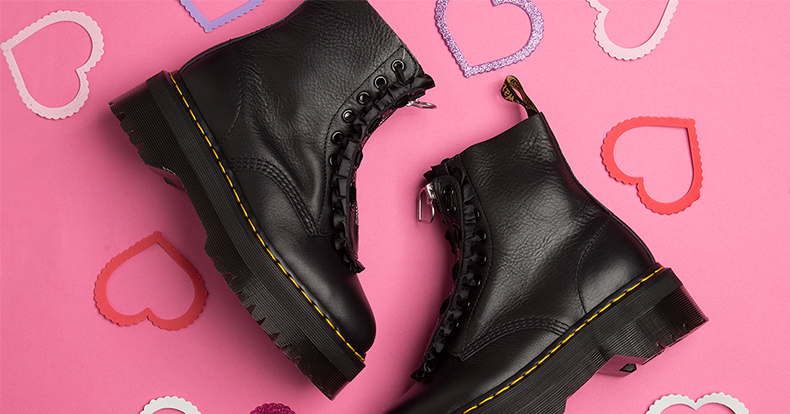 A double sole gives them a chunky, capable of conquering anything feel – and an exposed zip adds a bit of punk attitude. Keeping on the heart theme though – there’s a girly touch with a heart zip-pull and frilly leather panel. And not to forget ‘MY LIFE IS BORING’ blazoned down the back. Pick your favourite and take a step into the whimsical world of Lazy Oaf!